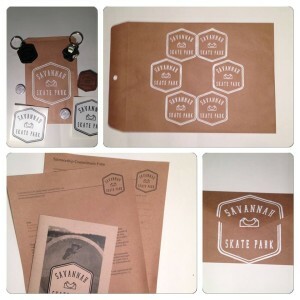 These packages were sent out to national and local businesses! 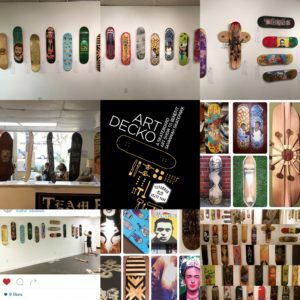 The very talented Peter Roberts and Juliana Peloso put together a pop-up art show with proceeds of art sales going toward the skatepark!! 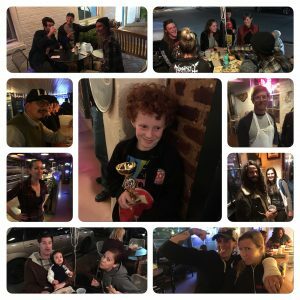 They helped us raise another $600 for the cause!! 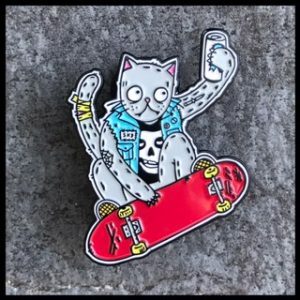 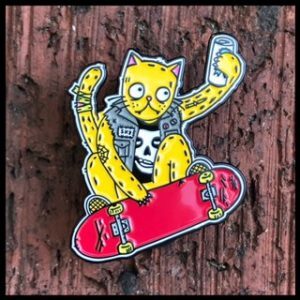 Our good friend Tittybats made some killer pins and donated all of the proceeds toward the skatepark!! 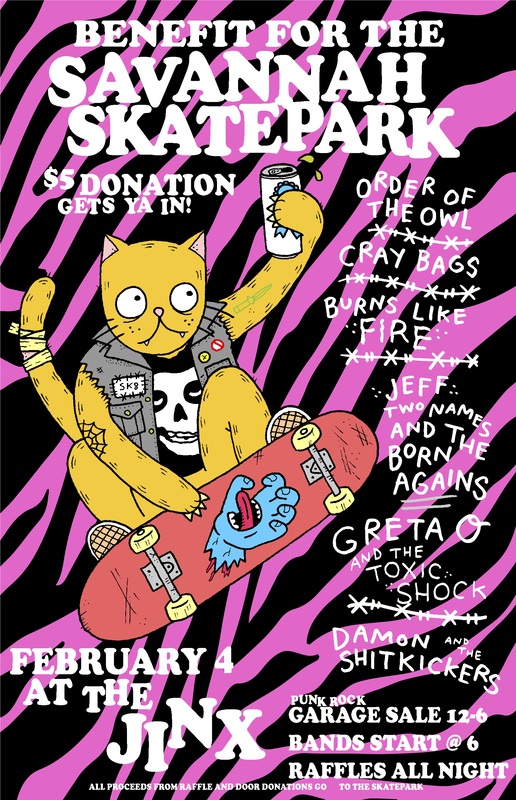 Over $700 was raised through this awesome fundraiser!! 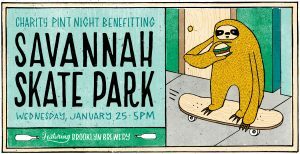 Janie and Peter Brodhead have been supporters of the skatepark effort since the beginning, and they continued their support by donating 5% of the sales to help us raise another $850 toward the skatepark! We can’t begin to thank them enough for their contributions over the years!! 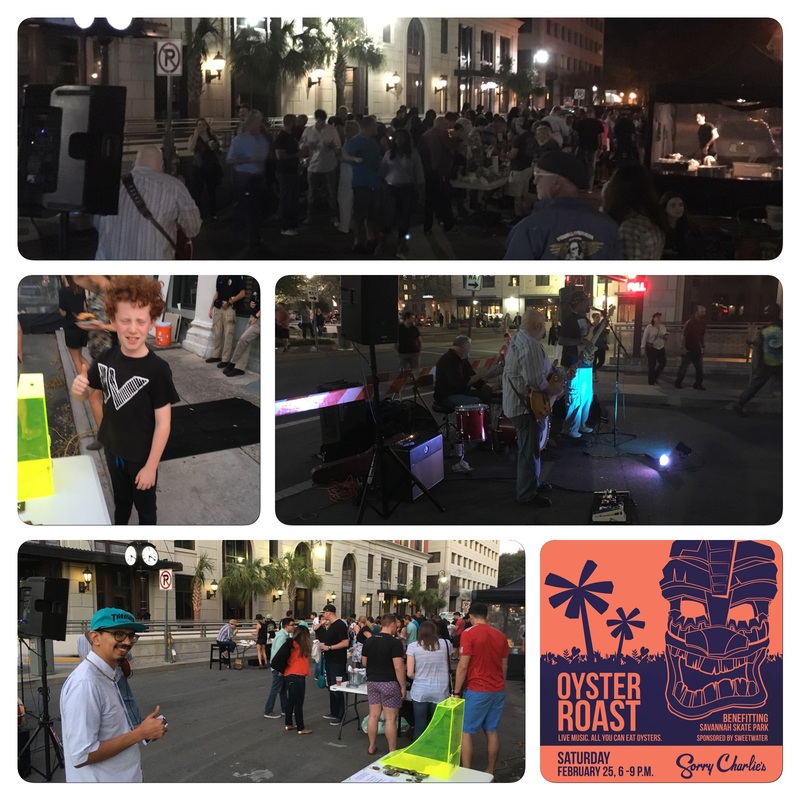 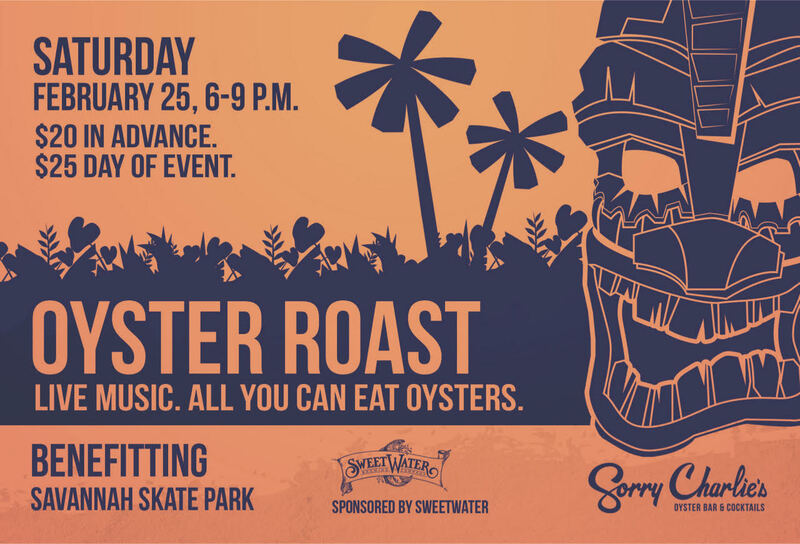 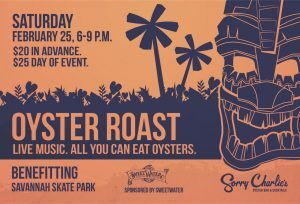 Sorry Charlie’s hosted an oyster roast and helped us raise $1450 for the skatepark! A big thank you to Mike, Harley, and the great staff at Sorry Charlie’s for making this event a huge success!! 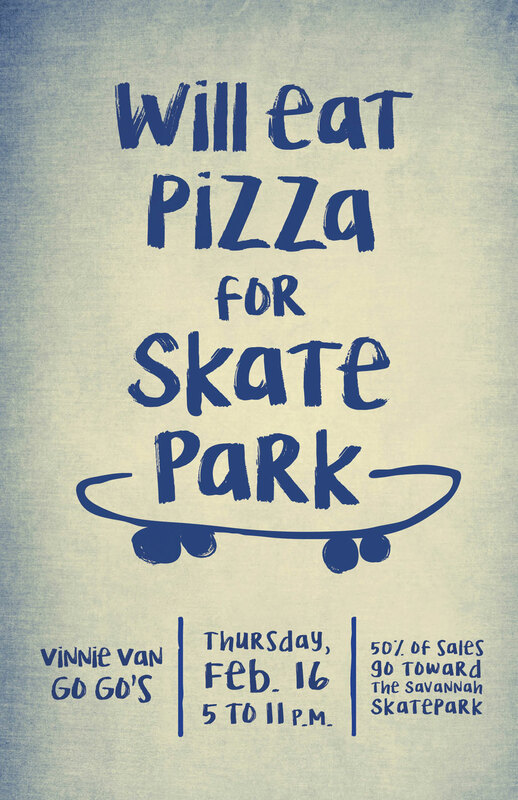 Vinnie’s hosted a fundraiser for us where 50% of sales went toward the skatepark! 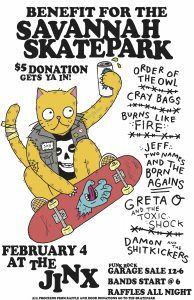 We raised a little over $2800 for the skatepark that night! 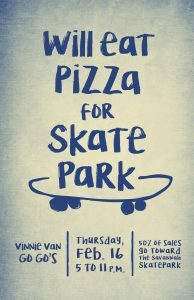 Thanks so much Paul Miller and the amazing staff at Vinnie Van Go Go’s and to everyone that came out! 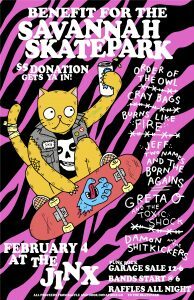 The Jinx hosted a punk rock garage sale during the day and then bands during the night to help us raise over $1400 for the skatepark! 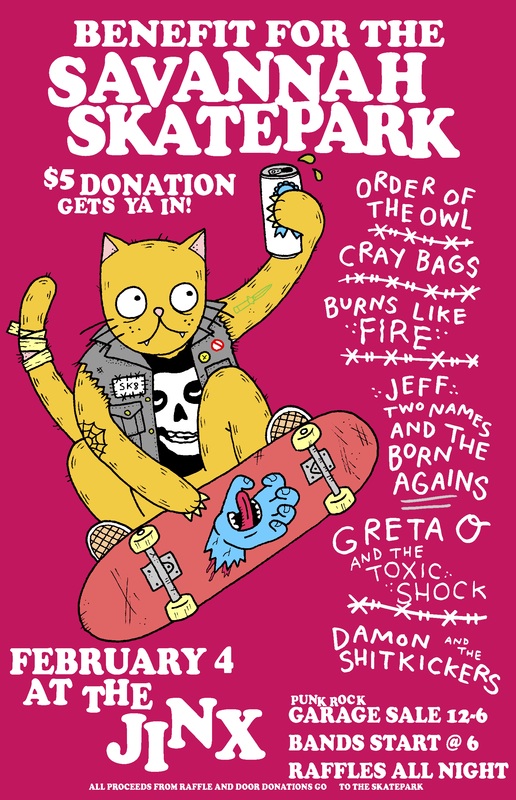 Big thanks to Gil Cruz, Greta O., Matt (tittybats), Damon and the Shitkickers, Greta O. and the toxic shock, Jeff Two Names and the Born agains, Cray Bags, Burns Like Fire, and Order of the Owl for making this event happen! 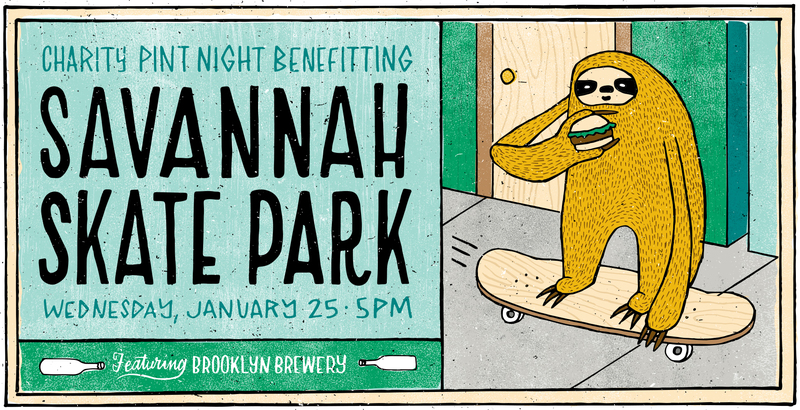 Josh and Whitney and the wonderful staff at Green Truck Pub hosted a charity pint night featuring Brooklyn Brewery and helped us raise over $1700 for the skatepark! 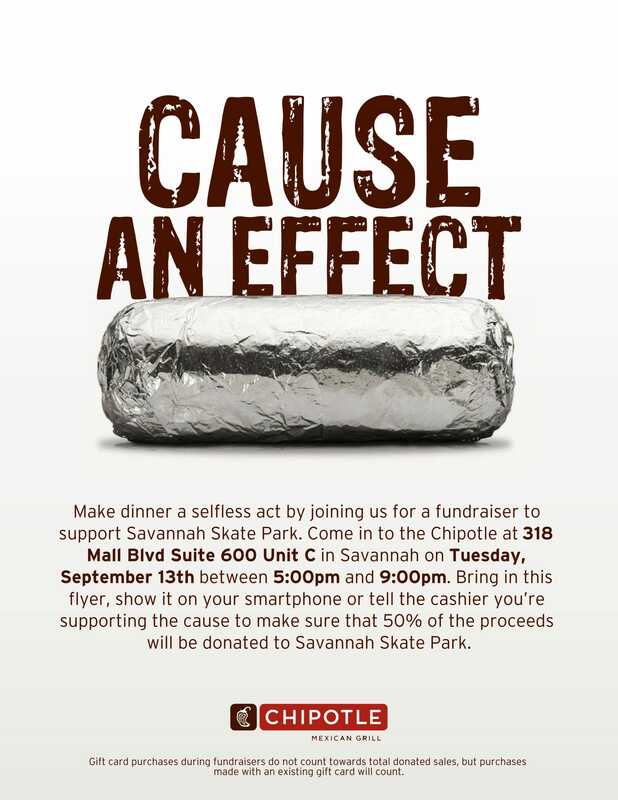 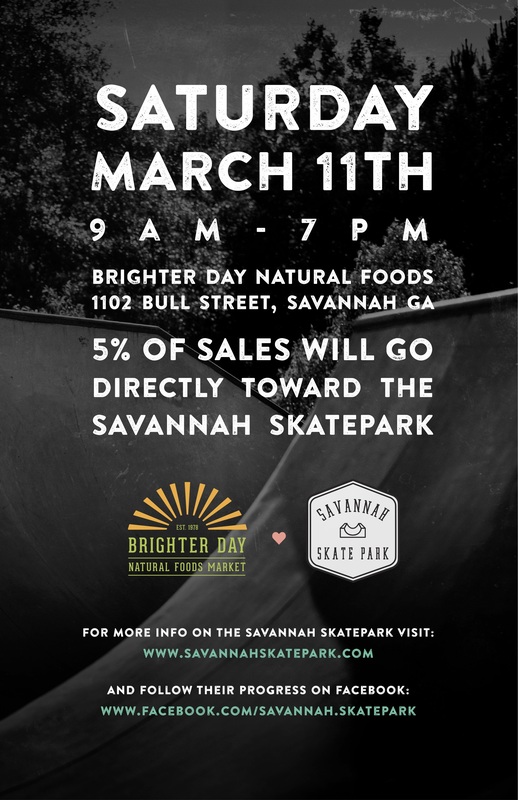 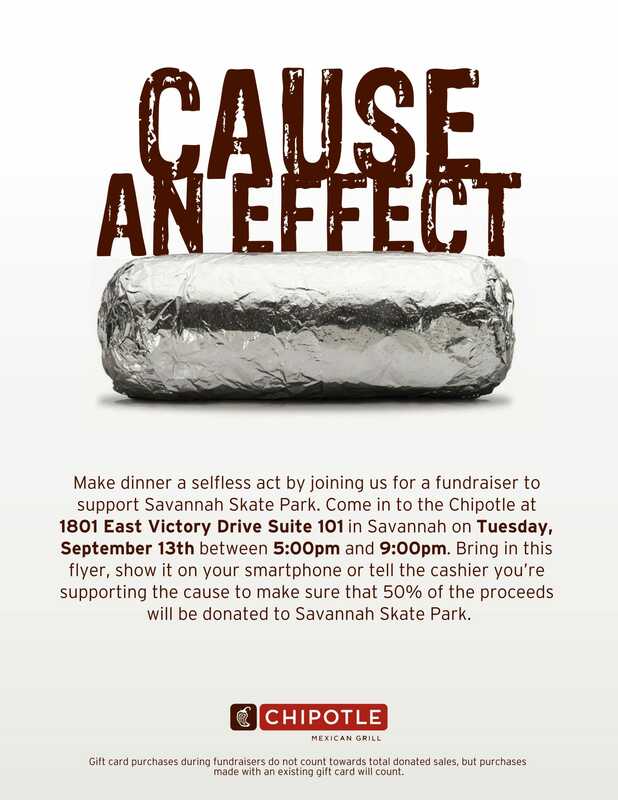 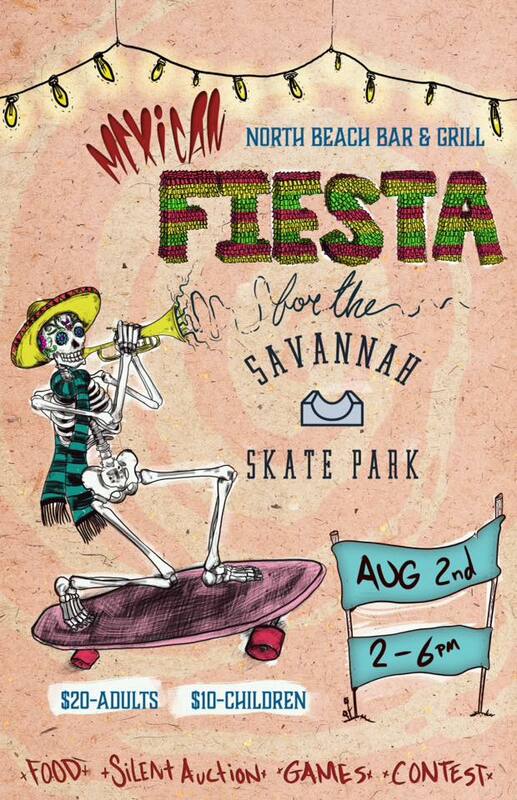 Chipotle was kind enough to donate 50% of their sales from both of their Savannah locations toward the skatepark! 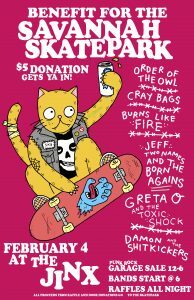 We raised $511.95 toward the skatepark!! 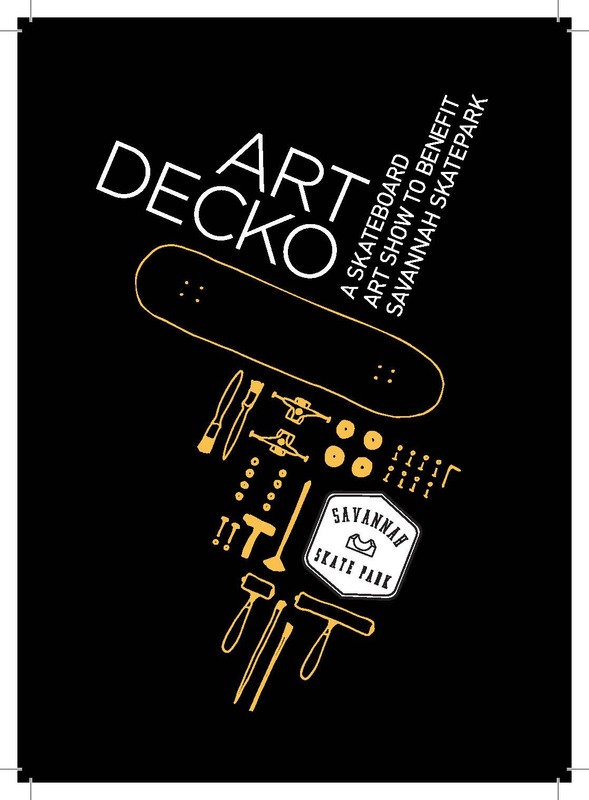 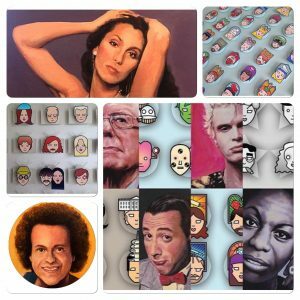 Over 100 artists contributed artwork on skateboards to help raise a little over $8,000 for the skatepark! 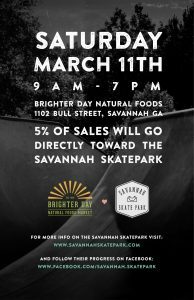 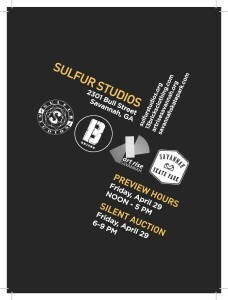 This event was largely made possible by Sulfur Studios, 13 Bricks Clothing, Brighter Day Natural Food Market, Le Chai, Service Brewing, and Clockwork Skateshop. 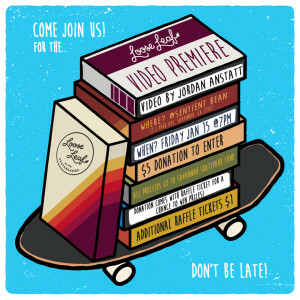 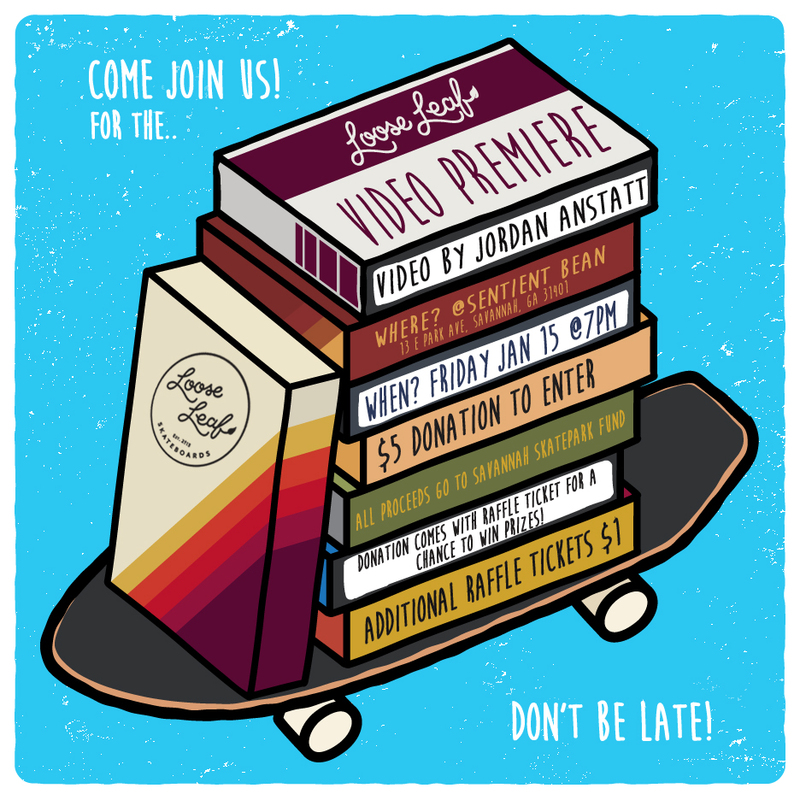 Loose Leaf Skateboards premiered a new video filmed by Jordan Anstatt to help raise over $550 to go toward the skatepark! 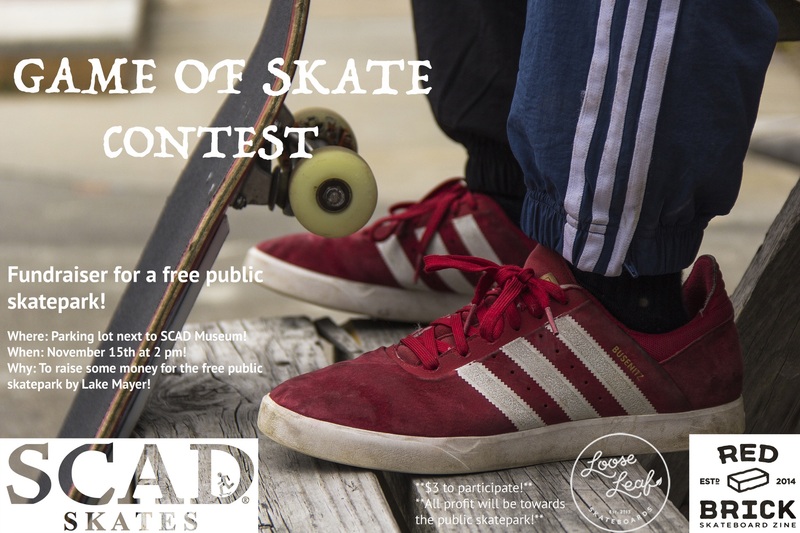 Our good friends at Loose Leaf Skateboards, Red Brick Zine, and SCAD Skates put on a game of SKATE to help raise some money! The fine folks at North Beach Bar and Grill threw an awesome fun-filled fundraiser that helped us raise another $3100 toward the cause! 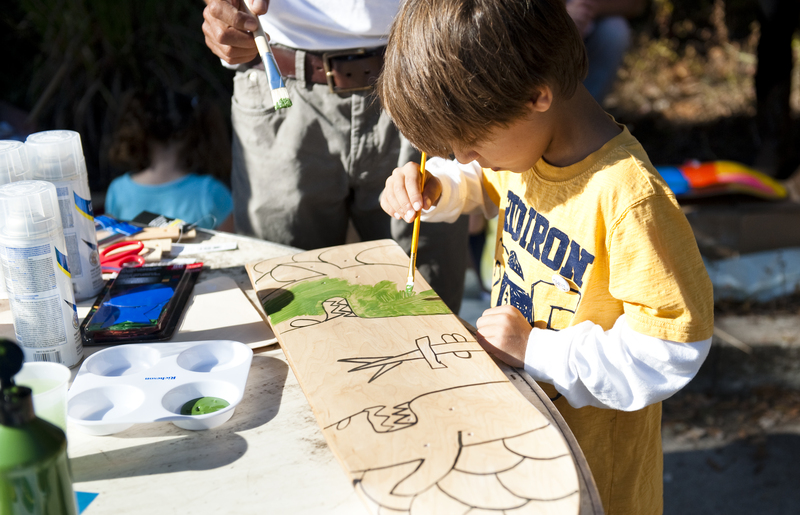 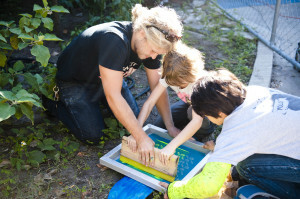 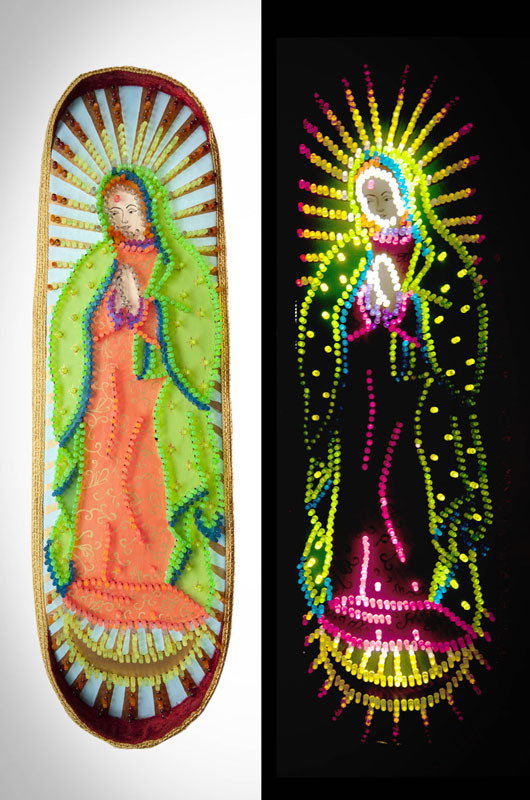 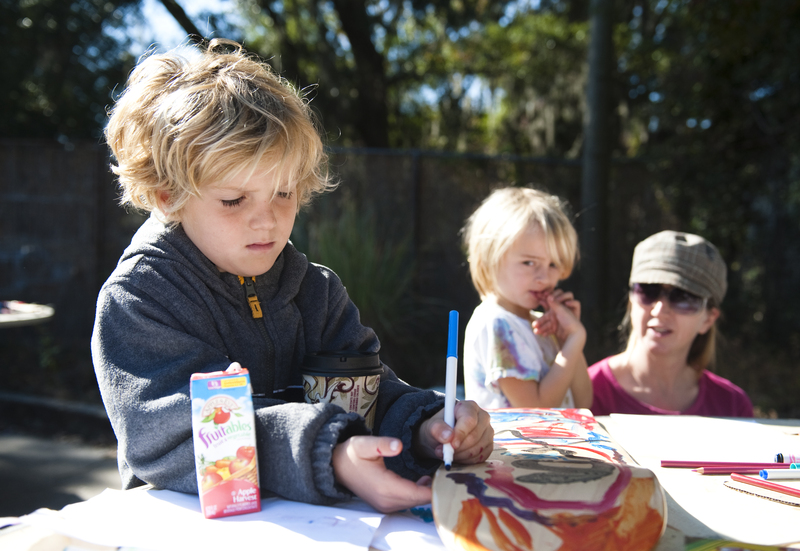 In the late Fall of 2012, we organized a 2 day camp for kids to create one-of-a-kind custom skateboards. 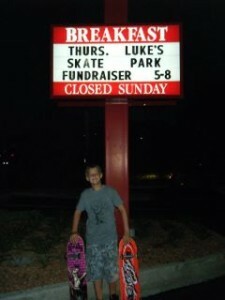 These boards went on to hang in Foxy Loxy Cafe for a whole month. 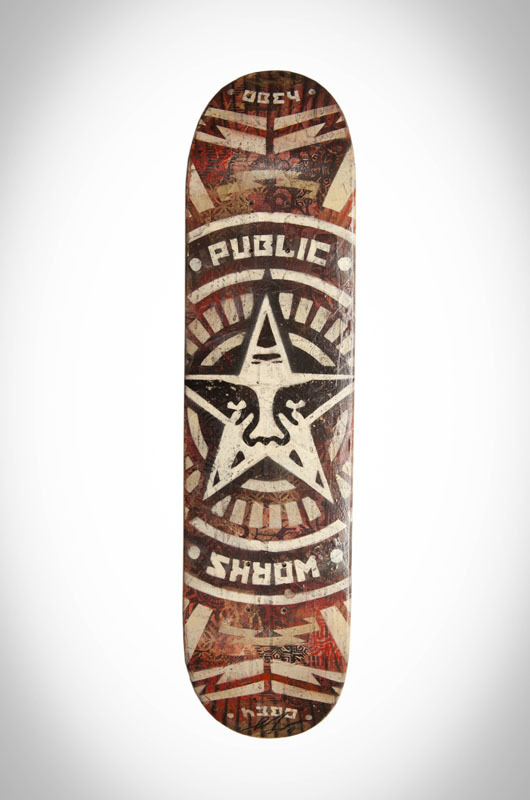 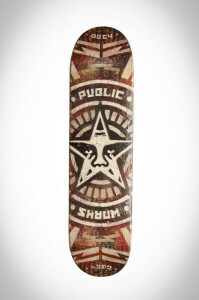 The proceeds from the sales of these skateboards helped us add another $1500 to constructing the skatepark. 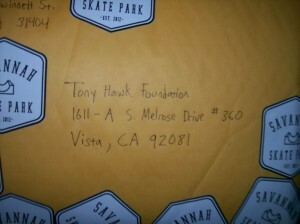 We were the proud recipients of a $25,000 grant from the Tony Hawk Foundation!! 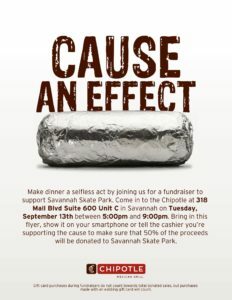 This is the maximum amount that they give!! 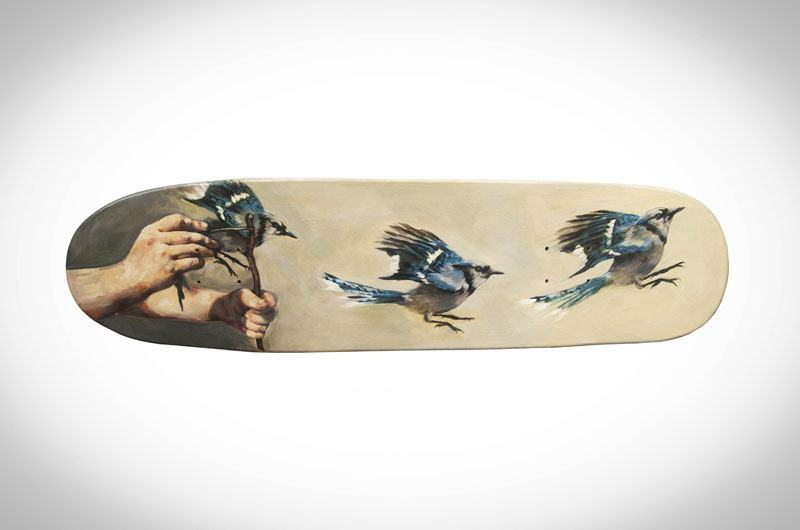 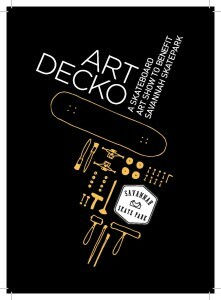 On Friday, October 14, 2011 a silent auction of skateboard art was held at Little Beasts Gallery. 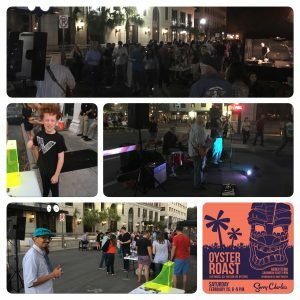 We had over 50 local and national artists participate in this event and raised $10,000 that night! This event took several months to plan and could not have happened without the help of Clara Fishel, Mary Cale Anderegg, Juliana Peloso, and Clayton Dodd. 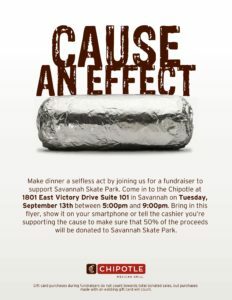 On Thursday, August 18, 2011 Chick-fil-A was kind enough to donate 20% of their sales to the Savannah Skatepark. 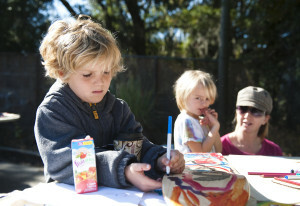 This event was put together by 10-yr old Luke Edenfield with a little help from his mother Kris. 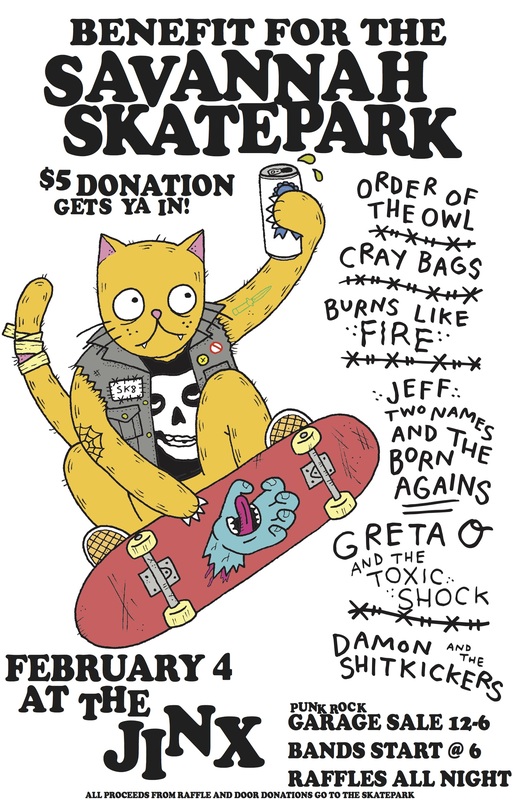 We raised $316.30 that night thanks to all of the folks that came out and had a #1 for the skatepark. 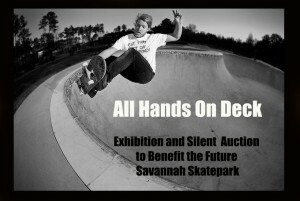 In 2009 Marc Jacobs launched a t-shirt campaign with 100% of the proceeds benefiting the Savannah Skatepark. 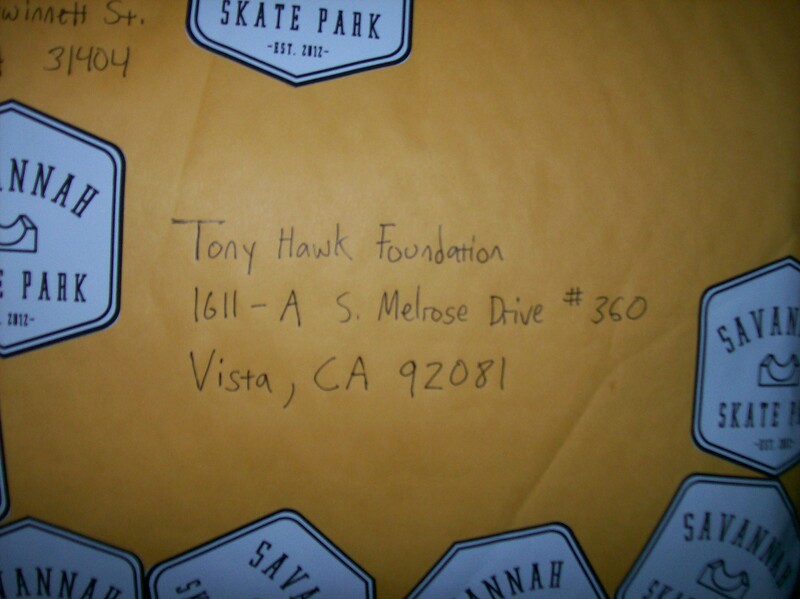 To this day we have received over $115,000 from this campaign. 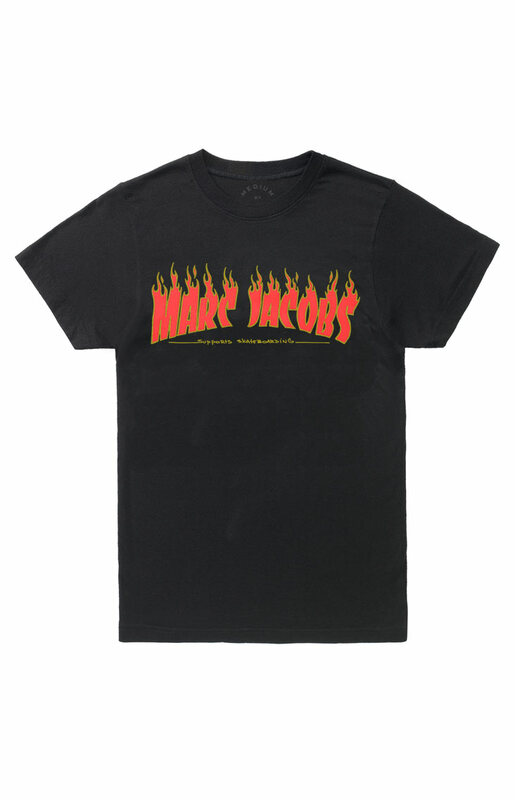 These shirts were made available at all of the Marc Jacobs store locations throughout the USA and Internationally. 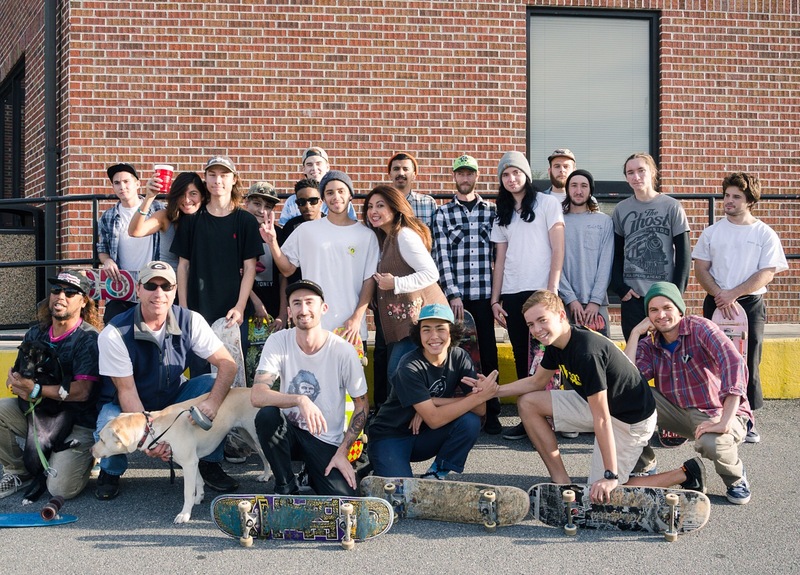 Marc Jacobs International is well on their way to being the largest sole contributor to the construction of a public skatepark ever! 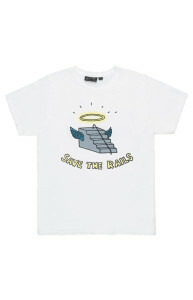 All photos copyright of Marc Jacobs International.